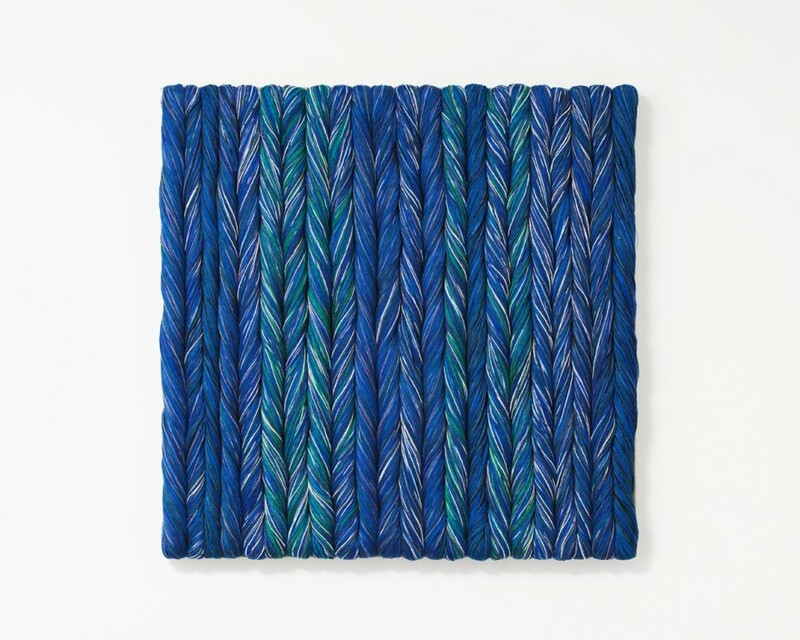 Sheila Hicks, Blue, 2017. Linen. 71 x 71cm, 28 x 28 ins. Image: Cristobal Zanartu. Alison Jacques Gallery presents a solo exhibition by Sheila Hicks: Stones of Peace. This is the artist’s second exhibition at the gallery following Pêcher dans la Rivière (2013). Other significant UK presentations include Foray into Chromatic Zones curated by Stephanie Rosenthal, Hayward Gallery (2015), and Mighty Mathilde and her Consort curated by Sarah McCrory, Glasgow International (2016). Sheila Hicks’ work is currently on show as part of the permanent collection display Beyond Craft, Materials and Objects at Tate Modern, London. Outside of the UK, Sheila Hicks' installation Escalade Beyond Chromatic Lands is currently included in the 57th Venice Biennale, Viva Arte Viva, curated by Christine Macel (until November 26, 2017). On view until March 2018, is Hicks’ new site-specific work Hop, Skip, Jump, and Fly: Escape from Gravity, for The High Line, New York, curated by Cecilia Alemani. Hicks’ next major outdoor commission will be located in the gardens of Versailles (21 October 2017 - 1 February 2018). Also forthcoming are two museum solo shows: Free Threads - Sheila Hicks, 1957-2017, Museo Amparo, Puebla, Mexico (3 November 2017 - 28 February 2018) and Lignes de Vie / Life Lines, Centre Pompidou, Paris (opening 4 February 2018). In Stones of Peace we encounter and experience various aspects of Sheila Hicks’ practice, from densely woven linen panels to soft sculptures and large scale Boules of intertwined yarns. While creating the show, she referred to works in progress as ‘slivers of sentiment, slumbering on the doorstep’. Through her limitless inquiry, we encounter a cacophony of colour, texture and form which results in a mysterious and subtle language of beauty with hidden and profound messages. Hicks communicates her perception of the world through her work; ‘If you keep your eyes open, you’re going to have a hell of a time’ (Sheila Hicks, Wall Street Journal Magazine, September, 2017). Sheila Hicks has been working and exhibiting for more than six decades, constantly innovating. Influenced by her research and travels in South America, she has developed a unique vocabulary which defies categorisation, transgressing the boundaries between painting, sculpture, design and architecture. Her mastery of materials, including rayon, slate, polyester, stainless steel, cotton, silk, linen, wool and bamboo along with pure pigmented acrylic fibre has enabled her to invent new forms in varying scales. Throughout her career, Hicks has produced Minimes, intimate objects and weavings. In many ways Hicks’ Minimes act as diaries, their titles often referencing places and cultures experienced on her extensive work-related travels to Africa, Asia, and Latin America. Parallel to these smaller works, Hicks produces on a grandiose scale; both indoors and outdoors. Sheila Hicks was born in Hastings, Nebraska (1934). After studying at Yale University, she lived and worked in Chile and Mexico before settling in Paris (1964). Hicks’ first solo shows took place in Argentina, Chile and Mexico in the late 1950s and early 1960s. In 1963, she had an exhibition of her weavings at The Art Institute of Chicago. Numerous solo exhibitions followed. In 2010, a major retrospective Sheila Hicks: 50 Years opened at the Addison Gallery of American Art in Andover, Massachusetts, before touring to the Institute of Contemporary Art, Philadelphia and the Mint Museum in Charlotte, North Carolina. Recent solo museum shows include: Contemporary Art Museum St. Louis, Missouri (2015) and Joslyn Art Museum, Omaha, Nebraska (2016). Key presentations include: Sao Paolo Biennial curated by Luis Pérez-Oramas (2012); Baôli, Palais de Tokyo, Paris (2014); Whitney Biennial, New York (2014); Espace Louis Vuitton, Munich (2015); 20th Sydney Biennial (2016). Sheila Hicks’ work has been acquired by major museum collections worldwide including: Tate, London; Victoria & Albert Museum, London; Stedelijk Museum, Amsterdam; Centre Pompidou, Paris; Louis Vuitton Foundation, Paris; Museum of Modern Art, New York; The Metropolitan Museum of Art, New York; National Gallery, Washington D.C; Art Institute of Chicago and Pérez Art Museum, Miami, Joslyn Museum, Omaha; Boston Museum, Massachusetts; Cleveland Museum, Ohio; Philadelphia Museum, Pennsylvania.